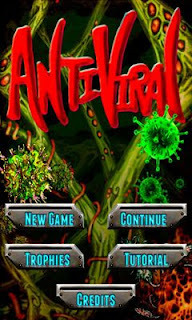 AntiViral is a fast-paced Top-Down Shooter with amazing weapons and shields at your fingertips! Boasting three different weapons (chain lightning, a cannon and a bomb) viruses dont stand a chance. Add in shields for manually stopping enemy fire and you have mans last hope to fight off extinction. It has wiped out nearly half of the planets population and shows no sign of slowing. You are piloting mans last hope and must find a way to destroy the virus in the face of extinction.